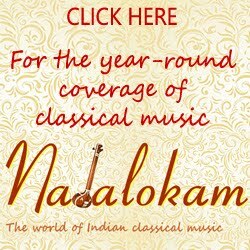 Hon'ble Chief Justice of India P. Sathasivam will inaugurate the conference on Dec. 15 at 5 p.m.
1.45 p.m. - Trivandrum Dr. Baby Sriram (Vocal), Vaikom Padma Krishnan (Violin). 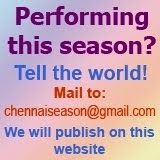 Is online tickets available for this December 2013 season??? No, the season tickets for the Music Academy will be issued on Jan. 2 from 9 am. People will be queuing up from early morning. Other than this there are daily tickets sold at the counter. Season ticket rates are Rs. 12000, Rs. 10000, Rs. 4000 and Rs. 1250. Great to see a detailed scheduled. You guys are doing an awesome job! Kudos! Keep it up! Just a correction...I think you meant Dec 2 instead of Jan 2!! If you could include in your details, the date on which Smt Sudha Ragunathan would be awarded the title ''Sangeetha Kalanidhi'' along with any other details. Thanks. The title Sangita Kalanidhi will be conferred on Jan. 1, 2014 in the Sadas to be held at 5 p.m.